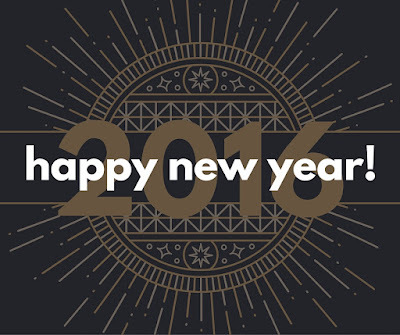 Wishing you all a healthy, peaceful, fantastic and beautiful New Year! I've been doing this fun project of wearing a different red lipstick every day for the past 12 days. This one is the one I'm liking the most color wise, it's Viva Glam Miley Cyrus. However, the texture is quite drying and it's not super comfortable to wear - although very long lasting. Have a merry Christmas, everyone ! Since we haven't done that in a long time, let's talk favorites, shall we? And actually, mu current favorites tend to end up all together on my face most days these days, so I'll walk you through what I'm wearing on this picture. I reviewed this foundation recently. There is really nothing else right now in my stash that makes my skin looks better! It's just enough coverage, just enough dewiness, a very reasonable longevity... everything that I like combined in a bottle! So I reach out for it most days. I had not used that concealer in year and suddenly started thinking of it again, so went and purchased it. I have had a few issues with concealers these past months. First, I fell in love with the Maybelline Age Rewind one (even though the shades were a bit too golden for me, I adored the formula) only to discover when I ran out that no retailer was carrying it anymore in my area. So I moved on to Maybelline Fit Me. Didn't like it as much but mostly, it made me break out around the nose very badly. And for some reason, my Estee Lauder Double Wear (another long time favorite) felt too dry and a bit cakey, so I wanted to go back to a more creamy product for Winter. 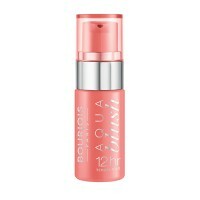 Blush: Bourjois Aqua in Cocoricorail. Ah, this liquid blush! I got it at the end of July, and wore it every single day for TWO MONTHS. I hadn't obsessed that much about blush in a long time! The formula is really comfortable to wear, especially if you have dry skin, because it doesn't turn to powder and so it never feels or looks dry. I just apply and blend it with fingers and I'm done. I must say that I tried 2 other shades in that range, though (they have 4) and didn't like them as much. The pink is okay but nothing special, and the beige is so pale it hardly shows up even on my pale skin. So, if you get one, get the corail! Eyeshadow : By Terry Ombre Blackstar in Misty Rock. Now this is a product I resisted purchasing for a year. And really, I shouldn't have. Look how gorgeous it is! Why did I wait for so long? Well I have a lot of stick eyeshadows from Laura Mercier and Kiko and I found myself not really reaching for them. I found they stayed a bit tacky on my hooded eyes and that was unpleasant. Having to put powder on top to help with that, kind of defeats the purpose of using a cream stick shadow. But this one is a different story! The shade is complex, has a nice glitter to it, but mostly, you blend it up with a fluffy brush, then it sets and you're done. No stickiness, no creasing, you just look good for the rest of the day. So when I'm wearing it, I'm not wearing anything else at all on the eyes (although I think I'll smoke it up with black for Holiday parties). I definitely recommend the investment - but I read that only this one and Bronze Moon have that great texture, others being a bit more patchy, so be warned. Mascara : Chanel Le Volume in Rouge Noir (limited edition). I had never tried Chanel Le Volume mascara before, but I wanted to get the Rouge Noir edition as I thought it would look great with blue eyes - especially after having seen Ruth Crilly demo it. Now to be perfectly honest, the shade is not very noticeable, it doesn't look much different from black. But I do like the formula a lot - even if I am not crazy about the plastic brush. So I might actually get that mascara again in the future, in the regular black shade. I know some people complained it is flaking or smudging, but I have experienced none of these issues. What about you? What are your current favorites? Many brands released "serum" foundations, aka very runny liquid ones that requires a pipette, over the past year and a half. I had not tried any of them because the reviews I had read, made me think they wouldn't perform well on me in terms of coverage and finish. This Fall, Mac released its own serum foundation, and this time, reviews got me really interested so I decided to get it. I also got the new foundation brush they launched to apply it. What the brand is saying. "Introducing an innovative foundation that delivers colour in an ultra-fluid, elastic gel- serum formula. With a virtually weightless feel, this hydrating formula is extraordinarily comfortable, lasting for hours. 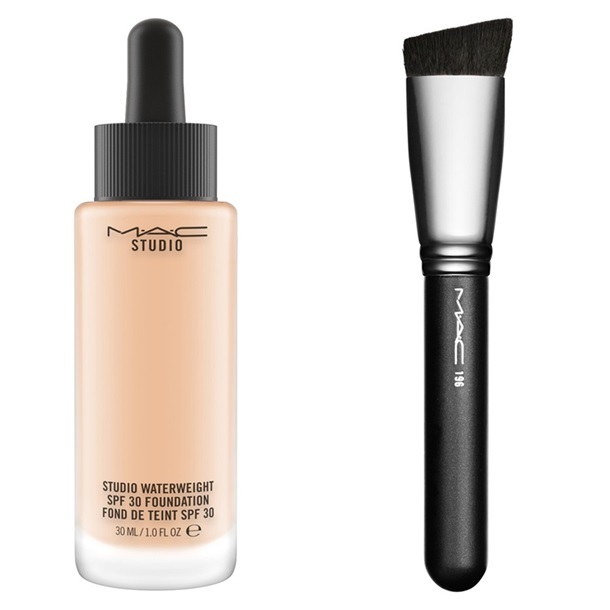 With stay-true colour and sheer medium buildable coverage, it softly blurs imperfections such as pores and fine lines. The unique dropper provides you with a drop of perfection. Use the new 196 Slanted Flat Top Foundation Brush for a naturally flawless finish." My impression on the product. I have been using this non-stop for a month now, and I absolutely love this foundation. Yes, it is hydrating and comfortable, even if you are dry and dehydrated. (I am however not really flaky at the moment so can't talk about that). Yes, it's quite buildable, although I find one layer already gives a nice coverage. Yes, it lasts very well all day without a primer underneath. And yes, it does blur all the imperfections and make me look absolutely flawless. I'm wearing NC15, by the way, and it's an excellent match for me. I have applied with the 196 brush and have not tried any other method, as I feel this foundation really need to be buffed well with this kind of dense brush. I would definitely recommend this for normal do dry skin, but a warning though: it is silicone heavy. If you have issues with that, stay away. For me, fragrances are what bother me, and this foundation has none, so that makes it even better. I am perpetually on the fence about Charlotte Tilbury's range. Even though I don't like her marketing approach (she makes me cringe) and I think a lot of her products are overrated, I have to admit that some of her products (not all, but some) are bloody good. And her Light Wonder foundation is HG material for me. It's a perfect match, it makes my skin look perfect, it feels great, what more could I want? Well, I was quite underwhelmed. I can even say I was truly disappointed. - I ordered shade 2, as that's my shade in Light Wonder. The undertone is the same, but it's a bit paler. And so though it matches my neck, I feel it's a bit too pale for my face and my natural color and some redness show through. Which is an issue I should not have with a full coverage product. - Full coverage? I really think not!!! When I got this I had a few breakouts and scars, redness around the nose, and undereye circles - well, nothing was covered or hidden with just a layer of that foundation. I did add a bit more on some places, added a second layer around the nose, to no avail. Foundations like Clarins Everlasting have way more coverage IMO. - Blurs everything? Well, for pores I somewhat agree, but it did enhance fine lines I normally don't see on my cheeks. So I don't agree - Light Wonder does a much better job at blurring everything IMO. - Finish : she says it's dewy, but it's clearly on the matte side. And although it feels very lightweight on the skin, it does feel dry. 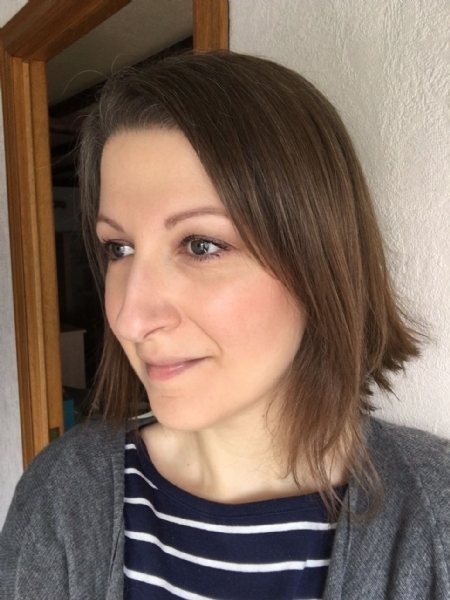 I tried it again with more moisturizer underneath, as well as with the Wonderglow primer (eh, another product I don't like that much) - but the feeling still wasn't great. I also think it does look dry on me, especially on areas where it has made fine lines more visible. - The glass packaging is pretty (although fragile) but the plastic pump on it looks cheap. So, is it Magic ? No. It's not very different than a Chanel Mat Perfection, in my opinion, excepted it's not scented (that's good at least). I think my face was looking flat every time I tried to wear it, even though I never powdered. I know everybody is raving about this foundation, but for me, I really think it'snot what it says it is. 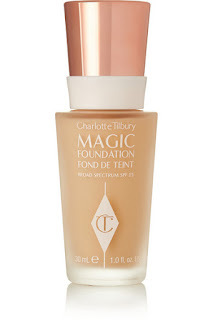 It is a light-medium coverage foundation for oily skin, with a mostly matte finish. Not something magic that will work for everyone. I don't see how you'd hide rosacea with this unless you put on several layers, and if you're dry, this is going to feel like hell.